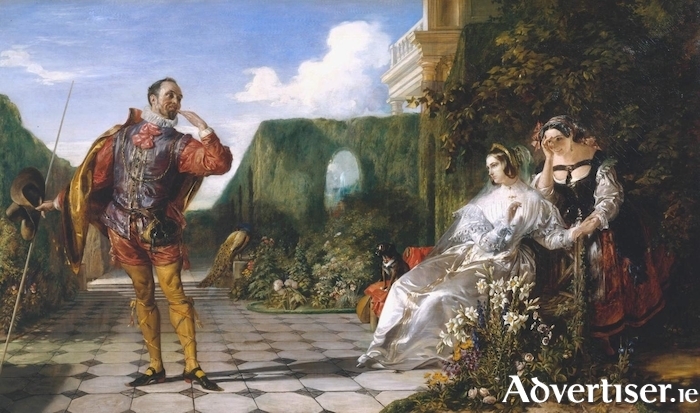 Malvolio and the Countess, an 1840 painting by Daniel Maclise. “IF MUSIC be the food of love, play on, Give me excess of it; that surfeiting, the appetite may sicken, and so die.” Spoken by Duke Orsino, this is the most famous line from Shakespeare's Twelfth Night. Twelfth Night, or What You Will will be performed by the students of the Drama programme at NUI Galway, in a new production directed by Max Hafler, running in the O'Donoghue Theatre for Drama and Performance, NUIG campus, from Tuesday February 13 to Saturday 17 at 8pm. Written in 1601/2 and first performed on February 2 1602, the play was inspired by the then tradition when, on the twelfth night after Christmas Day, the Eve of the Feast of Epiphany, servants often dressed up as their masters and men as women; a time of everything being turned upside down. Mixing farce, comedy, and what we would now call gender fluidity, Twelfth Night follows sees twins Viola and Sebastian become separated after a shipwreck. Unknown to each other they land in Illyria. Viola disguises herself as a man and seeks refuge in the court of the Duke Orsino, only to become involved in an impetuous love triangle. Will she and Sebastian ever meet again? Tickets are available from the Socsbox (091 - 492852 ) and The Mick Lally Theatre, Druid Lane (091 - 568660, www.druid.ie ).